The Armenian-Azerbaijani conflict over Nagorno-Karabakh does not have and cannot have a military solution and can only be resolved in a political and diplomatic way, Russian Foreign Minister Sergey Lavrov stated during a visit to Yerevan on Friday. “At this stage we consider it an absolute priority to ensure a full and strict implementation of the 1994 and 1995 ceasefire agreements, which are timeless in nature and as such must be respected by all parties,” the top Russian diplomat said at a press conference with his Armenian counterpart Edward Nalbandian after talks. Lavrov stressed that as a member of the OSCE Minsk Group mediating troika Russia will be doing everything to promote a full respect for the ceasefire in the conflict zone that earlier this month saw the worst flare-up of violence since 1994. Scores of soldiers as well as civilians were killed and wounded in hostilities that erupted on April 2 and continued till a Russian-mediated verbal agreement reached between the Armenian and Azerbaijan sides on April 5 to halt the fighting. In the diplomatic effort that ensued Lavrov and other officials in Baku and Yerevan made references to a peace plan for Nagorno-Karabakh that Russia offered back in 2011, but was rejected by Azerbaijan. One of the elements of the proposal was reportedly the introduction of a Russian or Russian-led peacekeeping force into the region. Some Russian media and experts in Armenia had suggested Lavrov would focus on this plan during his talks with Armenia’s leadership in Yerevan. A number of political and civil groups even held protests on Thursday against what they considered to be an “anti-Armenian” proposal that would include territorial concessions in exchange for a delayed status for Nagorno-Karabakh. Lavrov, however, did not specifically refer to what is known as the Kazan proposals during the press conference after talks with his Armenian counterpart. “I think that further delay of the implementation of these decisions would be wrong,” Lavrov concluded. 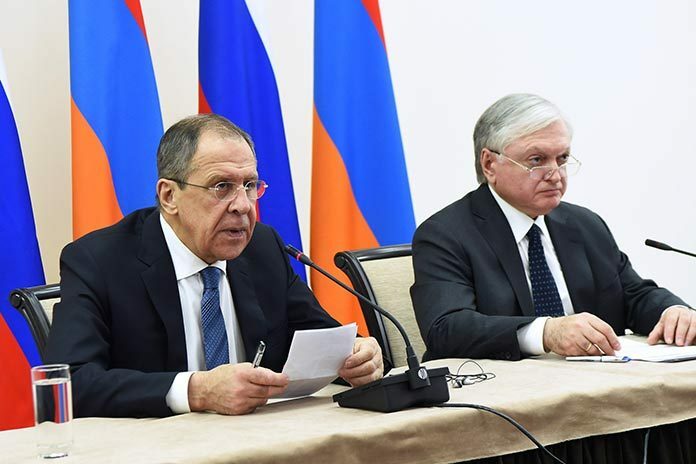 In his remarks at the press conference Foreign Minister Nalbandian said that his talks with Lavrov had focused on the recent escalation in the Nagorno-Karabakh conflict zone. He also stressed that the conflict in Nagorno-Karabakh has no military solution and called for an international condemnation of the use of force by Azerbaijan.